It can’t be possible. I can't possibly have PKD. Dad wasn't symptomatic until he was about seventy or so. Here I am, I'm not much past fifty and here I am. I know with the spring term being on, I had to start coming out with it. I told the players about my condition. I’d done this in the fall also, telling them I wasn't well, but this term I told the kids the first meeting, complete with the official name for the thing. I told Sr. Frances about my condition. I told Father Arsenio about my condition. The word gets around, and the parents are all talking to me. My colleagues are beginning to avoid me. I sense distance once I let them know what was happening and the word starts getting out. I'm on a low-protein diet, and I'm fatigued, having trouble sleeping. Between the low-protein and the little sleeping, I'm in a lot of trouble. An opposing coach catches me looking like I’m nodding out at the game. The opposing team is snickering. The kids win it for me; I’m the human interest story. They've probably never seen classic movies in their lives, but they're winning for me—the coach needs an operation! The kids are of course involved in normal real-time culture. They've named me J-Ziz and I accept it as the awesome name that it is. They worry about me. They want to know about the food restrictions. Sometimes I'm busted when they catch me eating the bad stuff in my office, which I do on a regular semi-regular basis. My standard speech is, “I'm not going to be one of these ‘do as I say, not as I do’ types with you. I'm on the straight and narrow a lot. But it's taking some getting used to. I gotta fall off the wagon sometimes or else (a) I'm not going to be human, and (b) I'm not gonna be happy." I'm entitled to this dog or murder-burger or whatever. 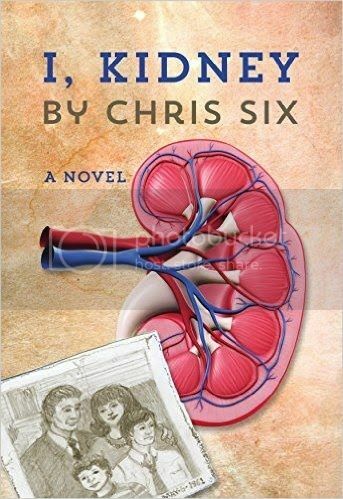 Chris Six is a New York-based writer and the recipient of somebody else's kidney. Thanks to all the good folks at Reading Addictions for making my first book blitz a blast! There's still enough summer for lots of good reads! Diagnosed with kidney failure, the semi-pro husband and devoted dad has life-and-death decisions to make--and life wins, though perhaps only by a slim margin. The book sounds interesting.